AMS MK7 Golf R Front Mount Intercooler – Equilibrium Tuning, Inc.
AMS is extremely excited to announce the second in our line of VW Golf R performance parts, the AMS VW Golf R MK7 Front Mount Intercooler! Our intercooler upgrade kit is a direct bolt on utilizing your stock mounting points with purpose built aluminum cast end tanks for the Golf R. This intercooler has over 64% more core volume than its restrictive stock counterpart. 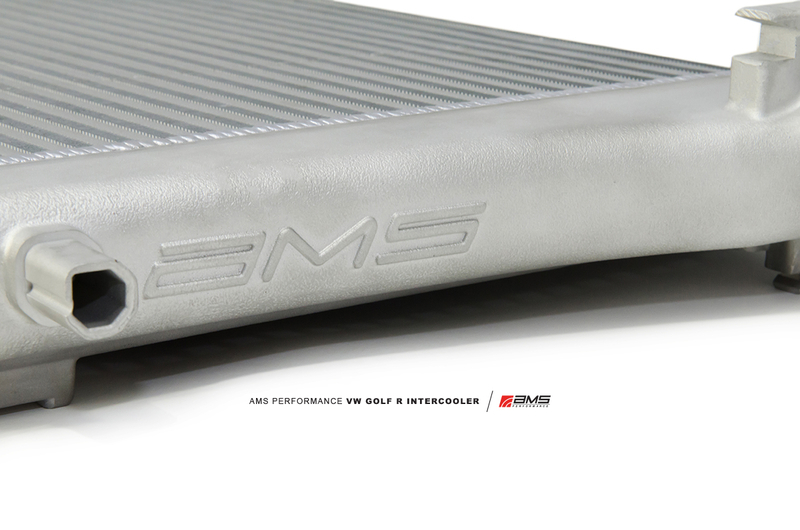 The AMS Golf R intercooler is the ultimate choice to keep your “Hot Hatch” cool! Our Engineering Team utilized Solidworks© (3D software) to blueprint the inlet and outlets with smooth features and geometry to optimize flow. The inlet side of the core has been design using CFD software with directional vanes to ensure even airflow and pressure spread across the height of the core.They then 3D printed the end tanks to ensure an OEM level of fitment before casting the first article. 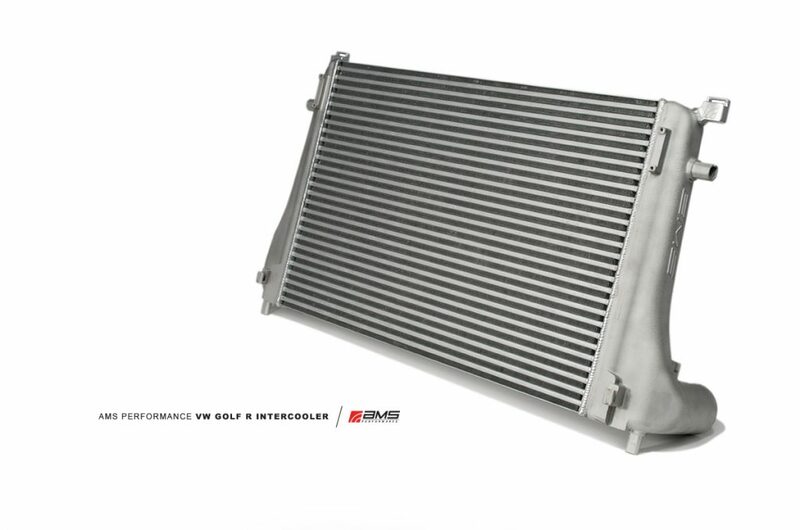 The AMS Golf R Intercooler features a high quality, high efficiency, tube and fin core imported from the UK. 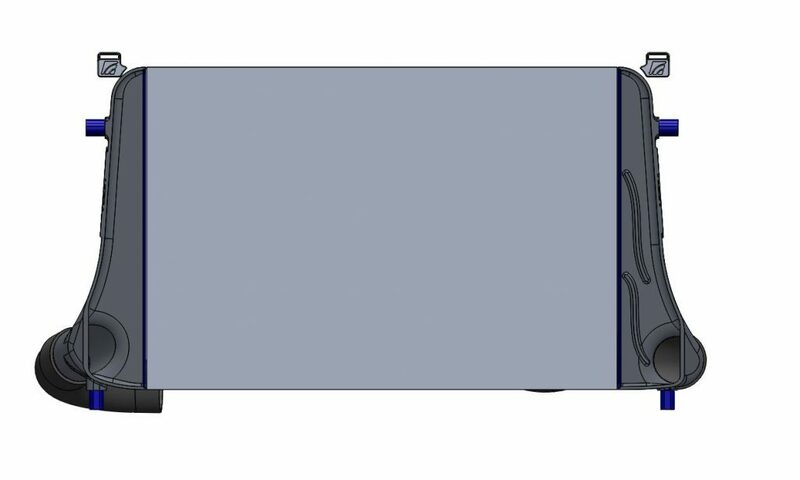 Some of our competitor’s cores are substandard pieces that require user modification to work with both types of stock radiators and cannot be easily put back to stock. By casting the AMS VW MK 7 Golf R Intercooler endtanks in aluminum we were not limited by the design constraints of hand fabricated construction. The AMS MK7 Golf R Intercooler upgrade kit uses the best performing core available. The fin and tube style core is over 16″ tall, more than 24″ wide, and features a 2.25″ thick assembly! 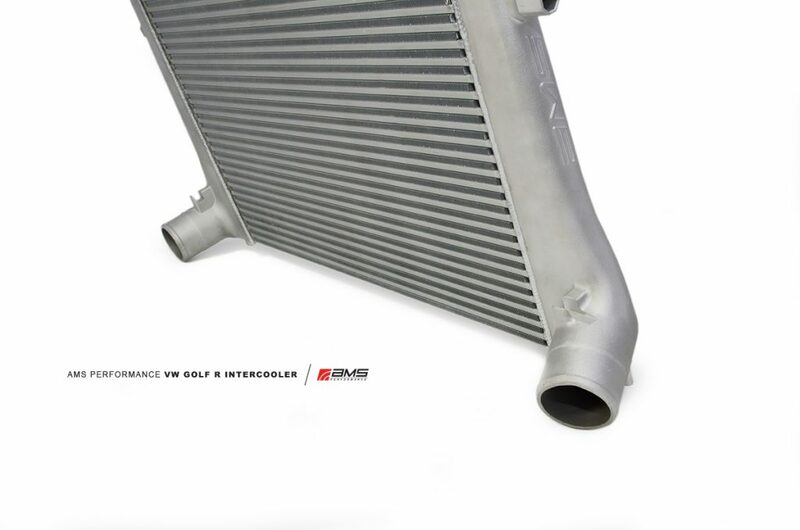 Our Golf R intercooler is an amazing 67% thicker (50mm vs 30mm) than the stock piece. The AMS MKVII Golf R Intercooler retains the factory crash beam, uses all factory mounting points and requires no cutting or trimming! The intercooler in the Golf R is the backbone for the entire cooling system. The car’s A/C condenser and radiator attach to either side of the intercooler so engineering this correctly is extremely critical for ultimate performance, fit, and durability. The AMS Performance VW MK7 Golf R Intercooler and its high efficiency tube and fin core utilizes 22 fins per inch. The AMS tube and fin core utilizes both internal and external formed/louvered fins which allow for smooth, unobstructed flow while maintaining a huge surface area with spectacular heat transfer capabilities. The results of our testing prove that our intercooler is the perfect balance of performance and efficiency for your Golf R. With its high degree of cooling the intake charge will remain cool even in the toughest of conditions. You will have piece of mind that your Golf R is running at its peak no matter if you are hot lapping at the track or driving spiritedly through your favorite winding back road. Rounded extruded tubes allow for a more efficient cold flow across the core resulting in less efficiency loss for the radiator hidden behind. Quality tube a fin cores made by reputable motorsports manufacturers feature exterior and interior formed LOUVERED fins designed to minimally restrict flow while having huge amounts of surface area to assist in the transfer of heat. Densely packed interior LOUVERED fins provide low pressure drop across the core while still providing excellent cooling properties. Due to the natural shape of a tube and fin core, contact between the factory AC Condenser and Radiator is minimized, eliminating conductive heat transfer between all three components. Core manufactured in Europe by a motorsports manufacturer. Same type of core used in almost all forms of motorsports including all F1/Indy car as well as trusted by all OEM manufacturers. Each AMS Intercooler is hand TIG welded in house utilizing a jig for a perfect fit and pressure tested to 50 psi to ensure the highest AMS levels of performance. With the AMS Golf R Intercooler, you have the flexibility to use this intercooler anywhere from near stock or Stage 1 power levels, all the way up to 800 HP! This intercooler along with our previously released Downpipe/Midpipe combination are two parts that are just the start of our plans to create the ultimate Volkswagen MK7 Golf R! Be the VW MKVII Golf R driver to beat! Order the AMS Performance Golf R Intercooler Upgrade today! AMS 2015+ VW Golf R Front Mount Intercooler Install Instructions can be downloaded here.